Scott Lucas was a powerful forward who in a career spanning 14 seasons became one of the Bombers’ most valuable and popular players. Scott Lucas made his Essendon debut on Anzac Day 1996 played 14 games in his debut season and won the club’s best first year player award. He played every game in 1997 winning the club’s most improved player award, and every game in 1998, to set the scene for what has become one of the Bombers’ finest careers. Tall, athletic and versatile with a booming left-foot kick, Scott Lucas was a great goal kicker, fine mark, and held down the key centre half back and centre half forward positions with equal effect. Injury spoiled his 1999 season but he burst back into the side in 2000, and what a year it was. Essendon dominated the year like no team before or since. In a star-studded line-up, with Scott Lucas at centre-half forward, the Bombers won 24 out of 25 games, including the pre-season Ansett Cup and a record 16th League premiership. Scott Lucas also chipped in with 57 goals for the year. In 2001 Lucas found his best form mid-season polling best and fairest votes in 11 of the last 19 games. He was also Essendon's best player in the 2001 Grand Final kicking 5 goals. In 2002, Lucas moved to centre half-back where he was a natural. 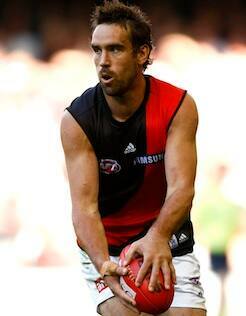 His fine anticipation, strong marking against the competition’s best forwards, were critical to the Bombers’ defence. The following year Scott Lucas won the first of two club best and fairest awards and was also Essendon’s best finals performer. In 2006 with the absence of an injured Matthew Lloyd, Scott Lucas flourished as the club’s dominant forward target all season. He was leading goalkicker with 67 goals and won his second best and fairest award. Perhaps his finest individual moment was in the last game of 2007. That day against West Coast Eagles in Subiaco, Scott Lucas kicked a career-high 8 goals, 7 of them in the in the final quarter, to almost single handedly win the game and put Essendon into the finals. Scott Lucas retired at the end of 2009 after 270 games and 471 goals. We induct Scott Lucas as a member of the Essendon Football Club Hall of Fame.